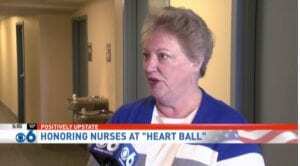 WRGB CBS 6 aired a story on the upcoming Capital Region Heart Ball, which this year honors cardiac nurses, including several from St. Peter’s Health Partners (SPHP). Norine Kelsey, RN, of St. Peter’s Cardiac Rehabilitation & Wellness, will be honored with the Donald Led Duke Heart Hero Award. Her son, Mark, who is a cardiac nurse at St. Peter’s Hospital, spoke to reporter Julia Dunn about his mother’s contributions to nursing throughout her long career. Rita Nelson, RN, PCCN, PCU, from Samaritan Hospital and Robert Dobski, BSN, RN, from St. Peter’s Hospital, were also interviewed for the report. Both Nelson and Dobski will receive Honorable Mentions at the Heart Ball, along with Nichole Berkery, BSN, RN, CVICU from St. Peter’s Hospital, and Paula Romeo, RN, CVICU, also of St. Peter’s Hospital. “Not a lot of people have the opportunity to professionally work with one of their parents, and it’s definitely been one of the highlights of my career,” Mark said. It’s not just her son’s life Norine’s helped change. It’s also the thousands of patients and families she’s worked with in a career spanning almost 50 years. On Saturday, she’ll be honored with the Donald LeDuke Heart Hero award. “I always put myself into their shoes. And think, how would I like to be treated?” Norine said. It’s a selfless attitude shared by other cardiac nurses we met at St. Peter’s. Click here to watch WRGB’s report.